Merlyna Lim, Canada Research Chair in Digital Media and Global Network Society, delivered a keynote talk at the Politicians and Social Media in the Global South seminar held on 14 April 2018 in Ann Arbor, MI. Organized by the ICTD (Information and Communication Technologies and Human Development) group at the University of Michigan’s School of Information, this one-day seminar workshop featured contemporary scholarship on political social media in the Global South. The workshop featured a mix of talks and small workgroup sessions to explore these topics, with specific attention to politicians and political collectives. Titled “Performing in Binary: Social Media and Contemporary Politic(ians) in the Global South”, Lim’s keynote offered a fundamental concepts for analyzing the relationship between politicians and social media. Using some empirical snapshots from a number of countries representing varied political systems, Lim also provided an overview of social media practices of country leaders in the Global South. 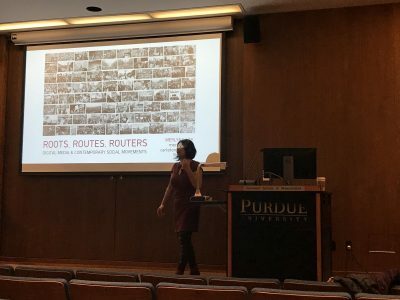 A month earlier, on 6 March 2018, Purdue University featured Lim as the first speaker of the Global Diversity Special Topics Series where she delivered a talk entitled “Roots, Routes, Routers: Digital Media in Contemporary Social Movements”. This talk is based on a monograph, with the same title, that will be published by Journalism & Communication Monographs (Sage) in June 2018.